For 6 consecutive years, Indonesia Open University or UT successfully hold national student table tennis tournament, which has given the births to many national table tennis stars who have been playing in various events, both national and international. In the series of events in UT’s 34th Anniversary or Dies Natalis, Indonesia Open University works together with Media Tempo for organizing National Student Table Tennis Tournament which is participated by 734 student athletes from 18 provinces throughout Indonesia on Friday, July 20, 2018 which takes venue at the Indonesia Open University Convention Center (UTCC). 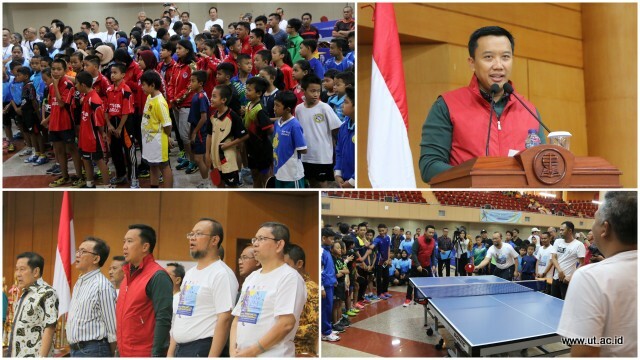 This Student Table Tennis Tournament is officially opened by dibuka secara resmi oleh Youth and Sport Minister Republik Indonesia, Dr. (HC) H. Imam Nahrawi, S. Ag. The opening ceremony was attended by Indonesia Open University’s Rector, Prof. Ojat Darojat, Tempo Director Toriq Hadad, and the President of All Indonesia Table Tennis Association (PTMSI), Commissioner General (Ret.) Oegroseno. The presence of Youth and Sport Minister was enthusiastically by the student athletes. Youth and Sport Minister personally accosted the athletes, each one of them, who are the next generation of Indonesia’s future table tennis. The Chairman of the Committee, Ali Muktianto, said that this year’s tournament sees an increasing number of participants, as in the last year’s tournament; there were around 400s participants from 13 provinces, as for this year, the corresponding number rises to 734 participants from 18 provinces coming from 61 clubs. 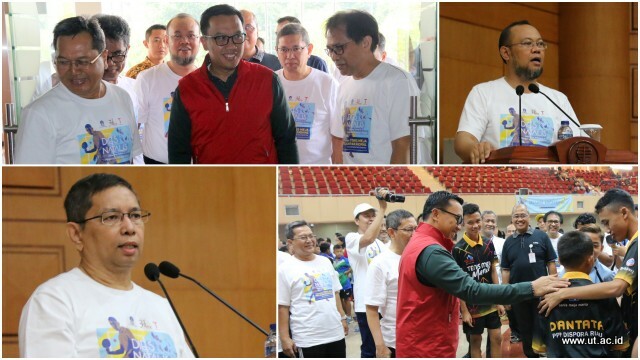 In his speech, Indonesia Open University’s Rector expressed his special thanks for the presence of Youth and Sport Minister RI among the table tennis junior players as well as Media Tempo as the organizer of the junior table tennis tournament. The Rector also added that UT is always ready to support and ensure the success of the government program, especially Ministry of Youth and Sport’s programs in the scouting of sport player seeds, for both national and international levels. According to the Rector, this activity is also established in order to strengthen the networking for the sake of the advancement of our table tennis in Indonesia. In the mean time, Toriq Hadad said that the number of participants is slightly down due to the preparatory programs for the upcoming Asian Games. According to Toriq, the table tennis players who take part in Asian Games event are the regular participants in the table tennis tournaments at Indonesia Open University or UT. “It proves an outstanding achievement,” said Toriq. Before the Youth and Sport Minister, Toriq also said that the contribution of Indonesia Open University or UT is so valuable and precious for the development of Indonesia’s table tennis. He mentioned that Tempo had been “provoking” UT holding this table tennis tournament every year as it serves the peering partner for such tournament. In his speech, Minister Imam Nachrawi, yelled a number of sport command greetings in order to boost the spirits and motivation of the junior participants. Youth and Sport Minister praised the host and organizer due to their professional tournament organization so it has been successful in that it gave birth to some great athletes. This is important strong foundation for the birth of the best generation who represents Indonesia in the world arena, no achievement with no involvement (tidak ada prestasi tanpa partisipasi),” said Imam. He also hopes that early age tournaments can be nurtured more intensively for the sake of the sustainability of the young talents so that they will be able to make a good reputation of their own local regions as well as the country. At the end of the activity, Youth and Sport Minister together with Indonesia Open University’s Rector as well as President Director of Tempo had the opportunity to play table tennis before the participants. Youth and Sport Minister also called the young athletes to join the game before the competition matches officially began.